I had a conversation with a friend the other day. We were talking about her situation and what her 5 year goals were. This is not an uncommon feeling. So many people understand – at a conceptual level – how business works: sell something for profit (i.e. for more than you paid for it). Yet the practical steps to get there are confusing. And the thought of “not making it” or “losing it all” is terrifying. So what is a driven, motivated person to do? There are plenty of people I talk to every day about business / entrepreneurship and the things holding them back. Fear of losing your investment – time, money, energy, etc. – is scary enough to cripple us into inaction. Instead of starting, we wait, hoping a guaranteed solution will fall in our laps. #1. The guaranteed solution you hope will fall in your lap? Not going to happen. If there were a guarantee, everyone would be a millionaire business owner. #2. Just because the solution isn’t a guarantee doesn’t mean there’s not a specific process that, if followed, will guarantee you see a return. And more importantly – it guarantees you won’t lose it all. What I’m talking about is The Barbell Strategy. 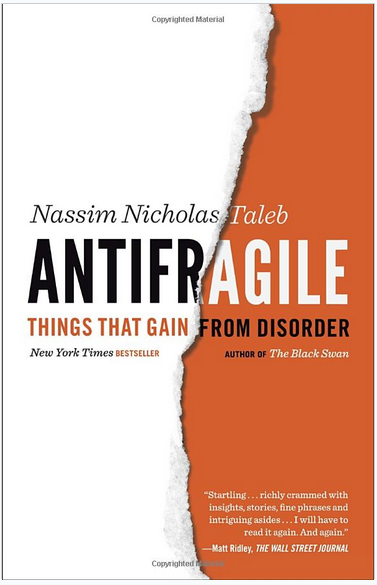 I first heard of the Barbell Strategy from Nassim Taleb in his critically acclaimed book: Antifragile. The Barbell Strategy refers to how Nassim traded stocks when he was a trader. Most people (retail investors), when they think of investing in stocks, take the “buy and hold” approach. The idea is – stocks always go up over time, so if you buy and hold, you’ll make money. Ask anyone heavily invested in the early 2000’s and more recently in 2007. Bubbles happen and things break. There are now hundreds of thousands of people without retirement funds nor credit to take out loans. Yet Nassim was left unscathed from these events. So what did Nassim do differently? In other words, Nassim specifically avoided the “sucker game” (“moderate” or “medium” risk investments) and instead positioned himself to take advantage of big movements and big swings in the market. By doing this – avoiding the seemingly safe bet the majority of people take (which, of course, is not safe) – he reduced his downside risk and maximized his upside profit. Now while this is a brilliant strategy for trading, it’s also an immediately applicable strategy for entrepreneurs. Entrepreneurship, after all, is by its nature uncertain and full of extreme events. Surely there’s a way we can apply this technique to our own businesses (whether just starting out or a 20 year veteran in the field). In the following sections, I’m going to show you how I’ve used The Barbell Strategy as an entrepreneur and ways you can use the same strategy to limit downside and limitless (and of course, profit when it happens). Pay money to find a market that is underserved. Pay money to create a product or service that solves the problem of this underserved market. Like “moderate” risk investments, this is the path the majority of people take when starting a business. Spend money up front to make a return later on. On paper, it seems like the safe middle ground. By investing so heavily in an idea before it’s been validated, we increase our downside exposure. And the greater the need for a large return, the greater the chance of not succeeding (and losing it all). Is it any wonder 80% of new businesses fail in the first couple years? Luckily, there’s another way, and it’s the Barbell Strategy. This way isn’t easy, and it comes with its share of struggles, but if you follow this approach you can guarantee your business or startup will never go under. And survival IS the battle when it comes to entrepreneurship. Do you need business cards, an office, virtual assistance from Pakistan, or a Hollywood-style filming studio to do your work? While it’s easy to get tempted to go this route under the auspice that quality matters, the reality is: “quality” (whatever that means) doesn’t matter – the only thing that matters is what people will pay for. And in most every case, it has nothing to do with the superficial. I just finished up recording a new episode of The High Speed Low Drag podcast with my friend and co-founder Antonio Centeno. We were talking about business marketing and how his website and YouTube channel that have brought in millions of views. I’m looking into doing more video production for my company and asked him if he’d been filming all of these videos in his professional film studio. He just – as in just this past month – built out a professional studio. Before this – for the past few years – he recorded everything from his house with a basic setup – no crazy lights, or backdrops, or 4k HD 3D cameras. Just him and his computer and a decent microphone. Antonio understands at a fundamental level that it is more important to validate an idea before pumping money into it, rather than pump a lot of money into a project hoping the return will be big enough to justify the upfront costs. Key Take-Away: If you want to survive as an entrepreneur, you must limit your downside exposure – this means investing as little money upfront into unproven initiatives as possible. Once your idea is validated (people pay for it), then you can put money into the expansion and scaling parts of your business. Ambitious entrepreneur quits school or their job, jumps 100% into designing MSDOS or whatever with a friend (in a garage) and then becomes a billionaire. This romanticized story makes it seem like they had no safety net, that they threw caution to the wind and leapt without care. Of course, if you know the history of most of these founders, they were anything but net-less. In almost all cases (I’m sure there’s one exception), these people had savings accounts, funds from family, money coming in through a trust fund or welfare or whatever. They were never completely sink or swim. The ones who were you probably never heard of because they sank (and because of survivor bias we never hear these stories). It’s not smart to jump 100% into something that’s not making enough money to support you. If you do, you increase your risk and downside exposure. If you take this approach, when the new software you develop goes nowhere, instead of being able to hold out and keep hustling until you hit your tipping point, you have to throw in the towel and get a job. Have a part time job or side gig (or passive income stream) that brings in enough cash for you to sustain operations indefinitely. This is different for different people. For me, it’s about $3,000 per month. If I can bring that amount of money in every month, I’ll cover my expenses and can keep working on my business, even if my business has a bad month. These revenue streams don’t even have to be related to your business (and to limit downside risk, probably shouldn’t be). I’ve written more about that here. Key Take-Away: If entrepreneurship is survival (and it is), you need to have a consistent revenue stream that allows you to keep operating even when you go through a dry spell in your business. This could be consulting, freelancing, contract work, investments, or a part time gig – whatever it is, it must be able to support your minimal monthly operating expenses, or your chances of survival and success drop dramatically. While the first two steps are about limiting downside, step 3 is all about maximizing the upside potential if something hits its mark. Focus too much time, effort, and money into one project (before product/market fit) over another and you increase downside risk and decrease probability of success. Taking the 1/N step further, the key is to ONLY start projects that have extreme potential payout. What is extreme potential payout? It means something that you can build and walk away from and it still makes you money. Ideally lots of money (to make up for the risk involved). I’ve mentioned my friend (and also co-founder of High Speed Low Drag) John Dumas before. 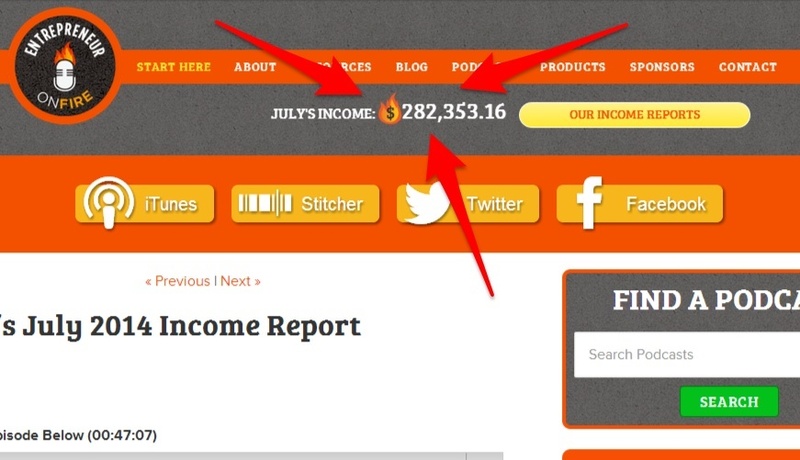 Recently John shared his July income report – a completely transparent view of his income and expenses. In July, he brought in$283,353.16. Yes, that’s the real revenue he generated in July. Yes, he’s that precise with his bookkeeping. More importantly: the greatest source of his income comes from products that continue to sell themselves without him being there. Sure, he needs to feed the funnel to keep sales going, but even if he took a week (or a few months) off, he’d still get new sales every day. 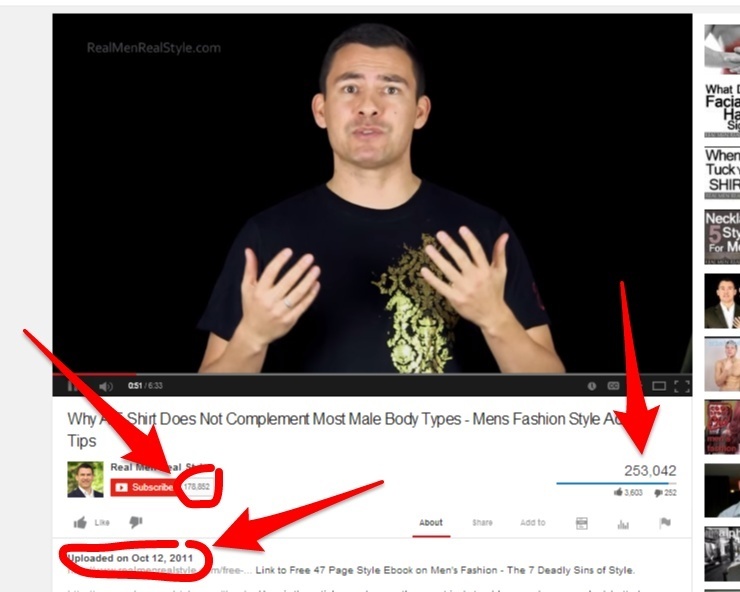 The beauty of this: now he can focus his time and attention on creating new revenue streams. This is what I mean by investing in projects with extreme potential payout. Key Take-Away: It’s not enough to limit downside risk. You must also expose yourself to the upside, and the best way to do that is to use the 1/N Technique and only take on projects with extreme potential payout. Is the Barbell Strategy easy to implement? Of course not – but nothing worthwhile ever is. It’s also important to realize that this is not a technique for generating tons of money immediately. Those things never work (or will land you in prison). It takes time and effort to make this work. But if it didn’t, then it wouldn’t be worth it, would it? So the question is: when will you start? Started, finished, and shipped in Renton, WA. Thanks John! You’re definitely an inspiration man with well-deserved success. Keep killing it.